"Although the 8:00 p.m. broadcast had opened with a brief announcement that the story was science fiction and based on the novel by H. G. Wells, huge numbers of people across America believed it was real. Those who turned their radio dials for confirmation learned that other radio stations had interrupted their own broadcasts to follow the exclusive, live CBS Radio coverage about the Mars attack. Thousands called the station and thousands more called the police. Switchboards jammed. Hospitals began admitting people for hysteria and shock. Families in New Jersey rushed out of their homes to inform anyone not in the know that the world was experiencing a Martian attack. The state police sent a Teletype over their communications system noting the broadcast drama was 'an imaginary affair,' but the hysteria was already well beyond local law enforcement's control. Across New York and New Jersey, people loaded up their cars and fled. To many, it was the beginning of the end of the world. "The following morning, the New York Times carried a page-1, above-the-fold story headlined 'Radio Listeners in a Panic Taking War Drama as Fact.' Across the nation, there had been reports of 'disrupted households, interrupted religious services, traffic jams and clogged communications systems.' All through the night, in churches from Harlem to San Diego, people prayed for salvation. 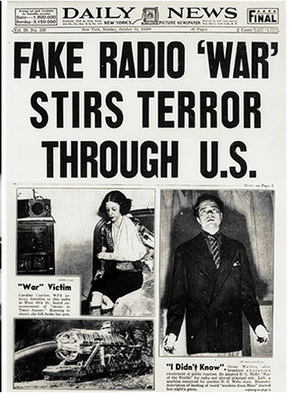 "The 1938 War of the Worlds broadcast tapped into the nation's growing fears. Just two weeks before, Adolf Hitler's troops had invaded Czechoslovakia, leaving the security of Europe unclear. Rapid advances in science and technology, which included radar, jet engines, and microwaves, left many Depression-era Americans overwhelmed by how science might affect a coming war. Death rays and murderous Martians may have been pure science fiction in 1938 but the concepts played on people's fears of invasion and annihilation. Man has always been afraid of the sneak attack, which is exactly what Hitler had just done in Czechoslovakia and what Japan would soon accomplish at Pearl Harbor. The weapons introduced in World War II included rockets, drones, and the atomic bombs -- were all foreshadowed in Wells's story. Advances in science were about to fundamentally change the face of war and make science fiction not as fictional as it had once been. World War II would leave fifty million dead. "From the moment it hit the airwaves, The War of the Worlds radio broadcast had a profound effect on the American military. The following month, a handful of 'military listeners' relayed their sanitized thoughts on the subject to reporters with the Associated Press. 'What struck the military listeners most about the radio play was its immediate emotional effect,' the officials told the AP. 'Thousands of persons believed a real invasion had been unleashed. They exhibited all the symptoms of fear, panic, determination to resist, desperation, bravery, excitement or fatalism that real war would have produced,' which in turn 'shows the government will have to insist on the close co-operation of radio in any future war.' What these military men were not saying was that there was serious concern among strategists and policy makers that entire segments of the population could be so easily manipulated into thinking that something false was something true. Americans had taken very real, physical actions based on something entirely made up. Pandemonium had ensued. Totalitarian nations were able to manipulate their citizens like this, but in America? This kind of mass control had never been seen so clearly and definitively before. "America was not the only place where government officials were impressed by how easily people could be influenced by a radio broadcast. Adolf Hitler took note as well. He referred to the Americans' hysterical reaction to The War of the Worlds broadcast in a Berlin speech, calling it 'evidence of the decadence and corrupt condition of democracy.' It was later revealed that in the Soviet Union, Joseph Stalin had also been paying attention." Delanceyplace.com is a brief daily email with an excerpt or quote we view as interesting or noteworthy, offered with commentary to provide context. There is no theme, except that most excerpts will come from a non-fiction work, primarily historical in focus, and will occasionally be controversial. Finally, we hope that the selections will resonate beyond the subject of the book from which they were excerpted. Sign up to receive Delanceyplace.com every weekday morning.